Made for the safety of kids in mind, the custom printed Youth Polycotton Legionnaire Cap is lightweight. Rush orders a breeze as is door to door delivery. With this promotional product you can now have that staff outdoor event that you can bring the entire family. 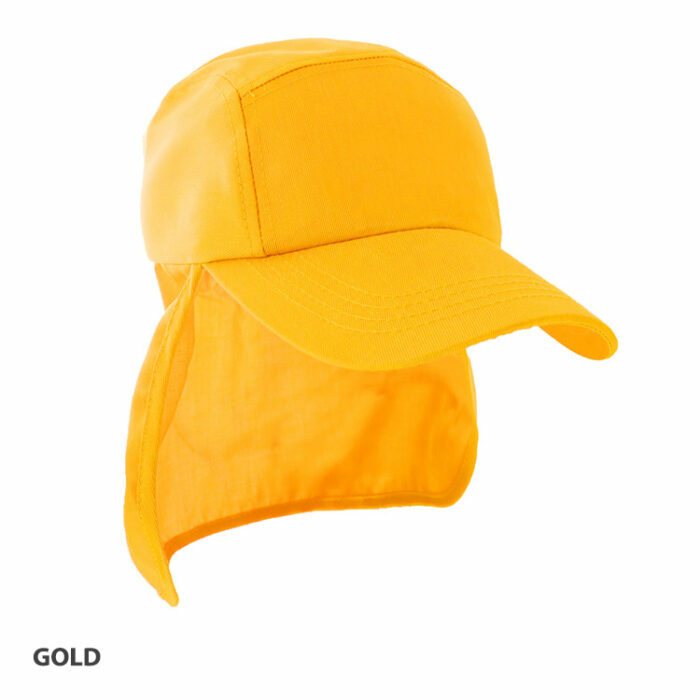 Introducing the promotional Youth Polycotton Legionnaire Cap. Now the little ones can come along with the grownups on every activity since mum doesn’t have to worry about the kids being sun burned. Just because it’s for kids doesn’t mean we’ve skipped on some details. We take kids seriously so we’ve packed in the same quality and attention to detail as with the rest of our products. The Youth Polycotton Legionnaire Cap is made of polycotton. Polycotton is a soft and tough fabric, making the Youth Polycotton Legionnaire Cap very comfortable to wear while at the same time very durable. 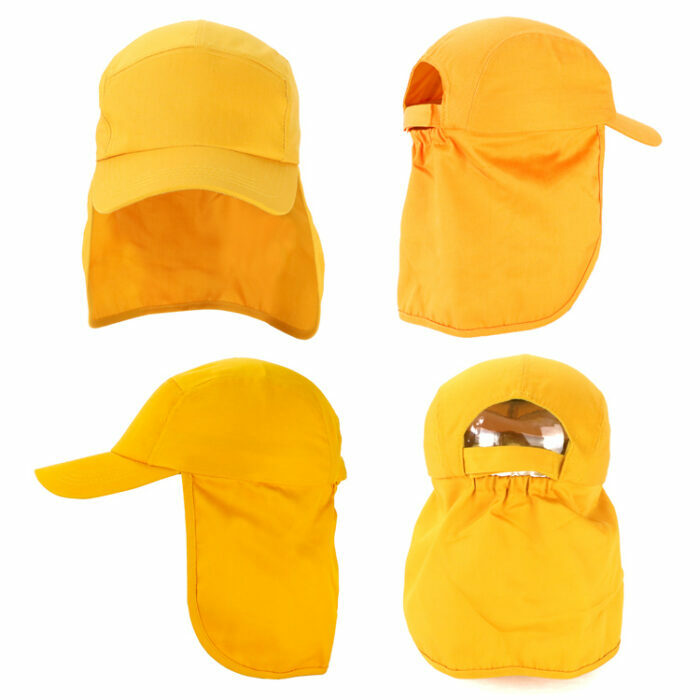 Featuring the structured five-panel design, the popular budget priced Youth Polycotton Legionnaire Cap gives full head to neck protection from all sides. At the front is a peak that provides shade for the face and the eyes. At the side and the back is a long flap that sufficiently provides cover even up to the neck. With such protective features, kids will always stay protected whether they’re running around playing or lounging around in the open. The custom Youth Polycotton Legionnaire Cap comes in six fantastic colours. Colours like Red and Gold are always popular for those into the more bodacious look, while Royal Blue and Navy Blue always go well for the casual look. Now all that’s needed is you company logo to be at the front and the decorated Youth Polycotton Legionnaire Cap is ready to rock. With your design on the low priced Youth Polycotton Legionnaire Cap, let the kids give you the marketing leverage at your next event. If you want to see another similar product, do check out the customised Luminescent Safety Cap plus Flap. All our products are made of the highest quality and best value for money so you’ll always be a winner. Keep your kids well-covered with our custom Youth Polycotton Legionnaire Hat. This hat is ideal for all kinds of weather conditions and outdoor activities. Reward a job well done with surprises such as our promotional Chocolate Medallions! Try out too our extensive lineup of promotional sweets. Have questions? Dial 1300 008 300, or hit us up for live chat and one of our friendly customer service representatives will be glad to chat to you.